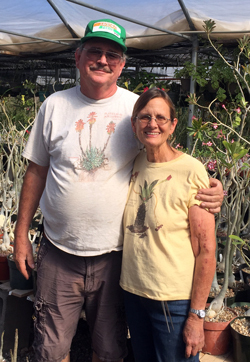 Owners Bob Webb and Toni Yocum have grown succulent plants for more than 35 years, many of which were obtained from Arid Lands Greenhouses before they bought it in 2006. They have traveled extensively in Africa and Arabia, looking for and photographing succulent plants. They have been to Oman, Yemen, Socotra, Kenya, Tanzania, Uganda, Namibia, Botswana, and South Africa. 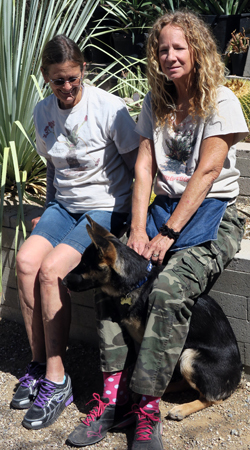 They live in the Sonoran Desert, and Toni is that rare Tucson native. Bob and Toni frequently give talks on their travels and expertise with plants. Bob is co-editor of the journal Sansevieria, the flagship publication of the International Sansevieria Society, and has described several Agave and Sansevieria for publication as new species. Angel Martinez, Dave Paiz, and Carrie Rose work at the nursery and can help you in person or on the phone. 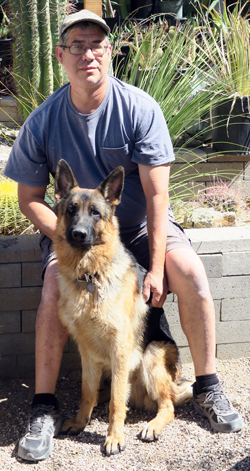 The three dogs you might see at the nursery are Kaspar and Katia (German shepherds). We no longer have a fax machine, please contact us with email or call us.